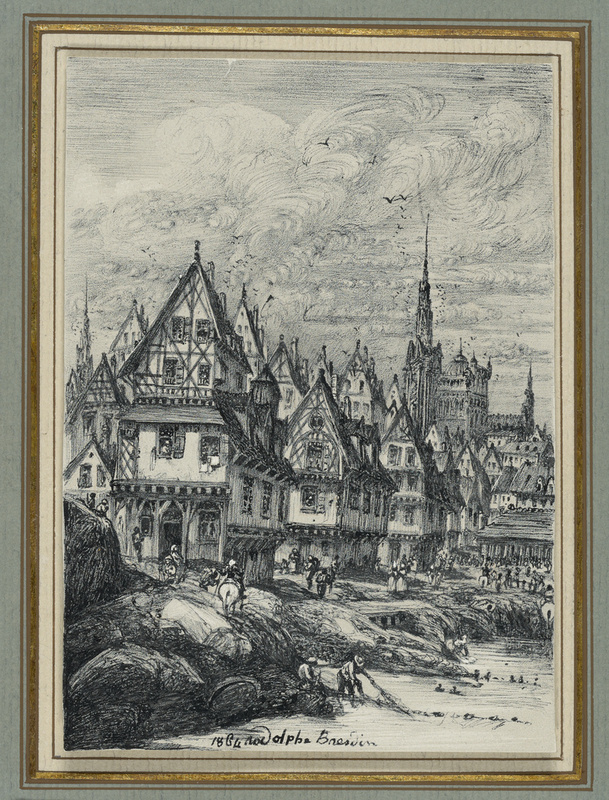 The drawing shows an imaginary fishing port. It is depicted in great, almost obsessive detail. Figures on foot or on horseback go about their daily lives. Some fishermen are tending to a net in the foreground. The middle- and background are filled with pointed medieval buildings, mostly half-timbered houses, and a tall Gothic church in the distance on the right. While the architecture is reminiscent of Normandy, the place depicted is clearly not a real one. Bresdin plays with the visual effects created by the old, crooked buildings, so that the architecture as a whole seems fantastical, and appears to have a life of its own. The moody, agitated yet finely drawn sky dotted with birds further adds to the romanticized view of everyday life in nature. Hendrix, Lee, ed. Noir: The Romance of Black in the 19th-Century French Drawings and Prints, exh. cat. (Los Angeles: The J. Paul Getty Museum, 2016), p. 161, no. 38, fig. 38.